We are excited to provide you with professional eyecare services in a comfortable and friendly environment. Please contact us today to schedule your appointment. Welcome, it's nice to SEE you! Our optometric family is looking forward to serving your family. 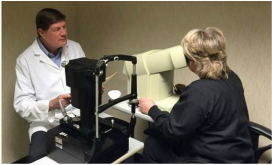 Our optometric facility is a state of the art handicapped accessible facility that welcomes the opportunity to serve all your eyecare needs. If you're looking for quality eyecare with a personal touch, we hope you'll give us a call. We look forward to the opportunity of serving your family's eyecare needs. We are located at 5685 Lafayette Road, Suite 200, Indianapolis, Indiana 46254. If you wear glasses or contacts, please bring them with you. In addition, if you have a written prescription or the packaging that the contacts came in, please bring that with you.